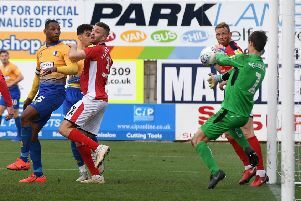 Mansfield Town will hope for rich pickings on Saturday away at a Northampton Town side whose season has already been written off. The pre-season expectation was to challenge for promotion straight back to League One after relegation last season, but one win in the first 10 and Dean Austin’s sacking quickly put paid to that. It’s been a disappointing campaign by and large, though, and a promotion challenge will be anticipated next season. Former Stags boss Keith Curle went in in and steadied the ship, dragging the club away from relegation and into mid-table, but has caused waves in recent weeks with his comments about his players, saying they were only capable of ‘playing ugly’. Their response was a 2-2 draw at Notts Couunty on Saturday after which Curle said: “There are five games to go and we still need to put in performances and we need to be building a platform to take the club forward and that’s what we’re here to do. “I think it’s going to be a scrap now against Mansfield. “I know what they’re going for and I know what’s at stake for them and I know how they play. “Mansfield will be up for a scrap and my changing room will be as well. Curle remains a divisive figure among supporters. Some feel he has done well to lift the Cobblers away from relegation and into the safety of mid-table while others believe he should have spearheaded a play-off challenge this season. The style of football has also come under scrutiny. In reality, he was appointed to avoid relegation to non-league and he’s done a good job with a imbalanced, underperforming squad. Centre-back and captain Aaron Pierre has been a key man with few players performing as consistently as him this season. He’s been commanding and solid at the back and will likely attract interest from clubs in League One and possibly even the Championship next season. Jack Bridge, if he plays, has often been Northampton’s main source of creativity since the departures of Matt Crooks and Kevin van Veen. In and out of the side in recent weeks, Bridge will likely play on the left or in the number 10 role. Brighton loanee George Cox remains out with an ankle injury while Shaun McWilliams will be a doubt for Saturday having struggled with his hamstring for the past few weeks. It should otherwise be a fully fit squad.